What We Do | Seros Financial, Inc.
FOR STARTERS, SEROS DIGS DEEP, ANALYZES THOROUGHLY, AND PLANS CAREFULLY. WE UNDERSTAND HOW TO OPTIMIZE YOUR DEFERRED COMPENSATION PLAN OR 401(K), AND WE CAN TEACH YOU WHAT TO LOOK FOR IN THE FUTURE. Most people only get one shot at retirement. That's why we help you take the guess work out of the process. We call it Seros360™. 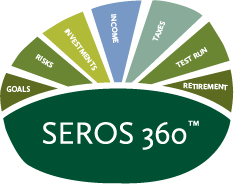 Proprietary, holistic and incredibly human, Seros360™ is a seven part mentoring approach to retirement. and understand the steps you have taken so far, to reach your goals. your risks and plan accordingly. you view risk, and your timeline for retirement. We know how to help you develop and implement these kinds of strategies. possible to keep your income engine running. retirement. We help you develop a strategy that balances your tax burden now and throughout retirement. be like to live on the income you'll have during retirement. If you need to make adjustments, we can help you do that before it's too late.